Sea palm found washed up on West Beach, Calvert Island. Photo by Jenn Burt. * This is north of the species' recorded range, which extends to Hope Island off the northern tip of Vancouver Island. While it is possible this sea palm traveled on a raft of kelp from that region, its good condition suggests it may have originated from somewhere closer. 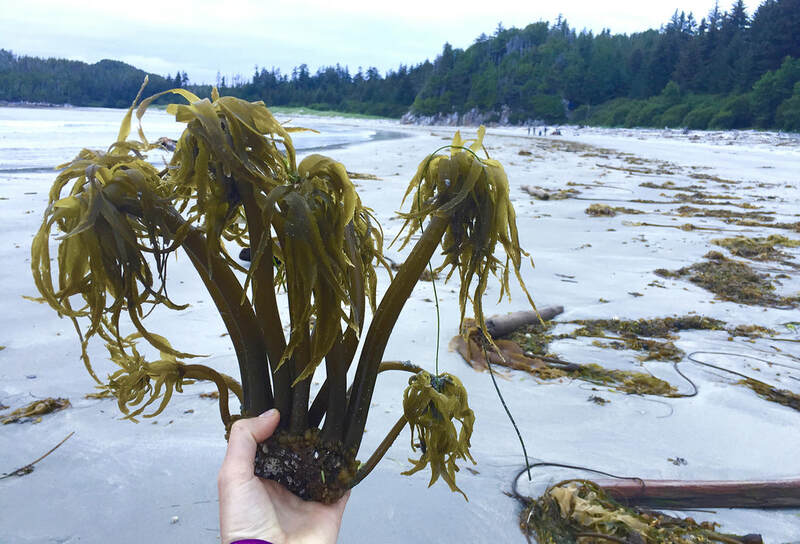 This brown seaweed has a distinctive palm tree shape. Its thick, cylindrical, hollow stipe tapers to a highly branched tip, and each stipe branch bears a single narrow, drooping, frond-like blade. Blades are grooved, which gives them a corrugated appearance. An individual sea palm may have more than 100 of these blades. The base of the stipe ends in a small, densely-branched holdfast (haptera). Young individuals are greener in colour, while mature individuals are golden brown. Sea palm gets to 60 cm tall, with blades to 25 cm long. See more images of sea palms. ​This species grows in dense stands on rock in the mid intertidal, along outer shorelines that are exposed to extreme wave action. It commonly grows within mussel beds. Its distribution is patchy, but it can be abundant where it does occur. Its recorded range extends from Hope Island off the northern tip of Vancouver Island, BC, south to San Luis Obispo County, California. * The sea palm photographed above was found north of the species' recorded range, but as it was found washed up on a beach its location of origin is not known. It possibly originated from the recorded range and traveled north on a kelp raft; it was in good condition, however, suggesting it may have originated from a closer shoreline. Palm kelp (Ecklonia arborea) also has a palm-like appearance, however its stipe is forked, forming two bunches of blades. It can also get much larger, with its stipe to 1.5 m and blades to 40 cm long. Sea palm grows among California mussel (Mytilus californianus) beds by colonizing areas of rock cleared of mussels by physical disturbance such as storms or predators. Read more about competition for space between these two species. Sea palm is edible and historically was harvested, however now only commercial harvesting in California is legal (recreational harvests are illegal in that state, and all harvests are illegal in BC, Washington, and Oregon). Read more about sea palm harvesting. Postelsia (Sea Palm). Multi-Agency Rocky Intertidal Network (MARINe). University of California Santa Cruz. Santa Cruz, CA. Accessed 20/03/2018. ​Postelsia palmaeformis Ruprecht. In Klinkenberg, Brian. (Editor) 2017. E-Flora BC: Electronic Atlas of the Plants of British Columbia [eflora.bc.ca]. Lab for Advanced Spatial Analysis, Department of Geography, University of British Columbia, Vancouver. Accessed 20/03/2018.